I've always loved cooking pasta dishes, whether it's tomato-based, cream-based, or oil-based. And speaking of oil-based, I've always been hooked on pesto, but found it tedious to make from scratch. I would probably make my own pesto sauce if it's for a really special occasion. 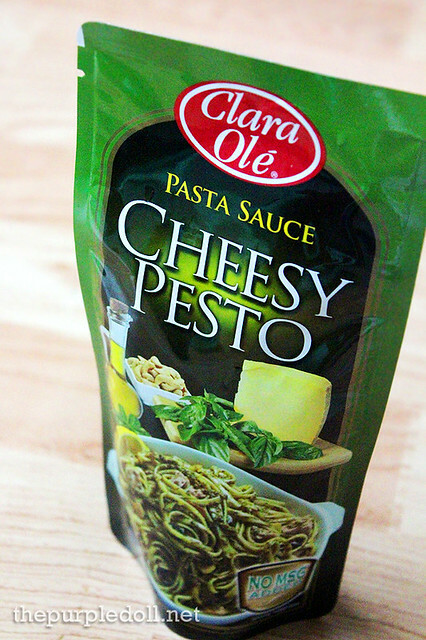 But for sudden cravings from either me or my little sis, I've always been thankful there's the just-heat Cheesy Pesto pasta sauce from Clara Olé. And nope, Clara Olé's Cheesy Pesto pasta sauce isn't the fake-tasting type. It was really made from basil, garlic, nuts, cheese and olive oil. I was once tempted to make a pesto pasta dish and claim I made the pesto sauce from scratch. But of course, I can't handle lying like that and I wanted to give credit to where credit is due. Yup, to Clara Olé! Heat olive oil in a pan and sauté the garlic until slightly golden (Not brown! ), then add the tuna and cook for about a minute or two. Add the Clara Olé Cheesy Pesto and heat for a few minutes. Season your pesto sauce (to your preference) with salt and pepper. Add chili flakes if you'd like some heat. 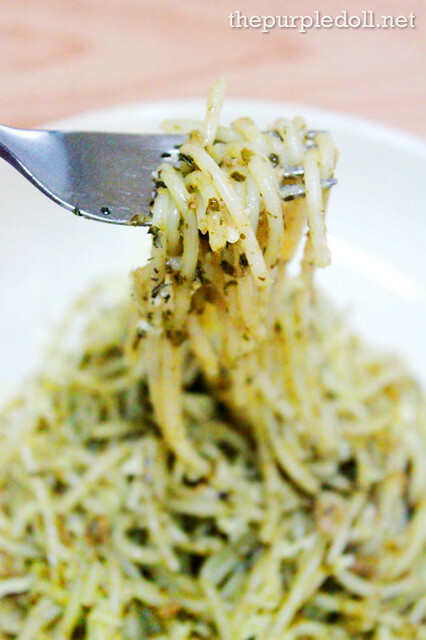 Put pasta (straight from the cooking pot) to your pesto sauce and mix well. You can add in some grated Parmesan cheese and some basil leaves. As for me, I prefer to garnish my pasta with some parsley since it was all I could find. This pesto pasta dish is very easy to make thanks to Clara Olé's ready-to-use, just-heat-up Cheesy Pesto pasta sauce. This recipe is very customizable too! If you don't like tuna flakes, feel free to use anchovies, shrimp, chicken, or even bacon! You can also go vegetarian and just add tomatoes. Or, go plain and serve the sauce as is. I once used a can of San Marino Chili Corned Tuna since it was all I could find in our cupboard. The pesto sauce turned orange-brownish though (look at that 2nd photo), but it tasted really good, and with a spicy kick. Even my little sister loved it! Next time, I'll try doing a creamy pesto pasta dish by adding cream. What say you? My mom cooks pesto with fusilli and strips of beef! The best! Must try out this recipe asap! I looove pesto, and the tuna is an added bonus! I've seen that in the supermarket actually, but never tried it yet. I will now! I haven't tried this because I was looking for Clara Ole Cheesy Pesto because I haven't find any on our nearest supermarket! Next time I'm gonna make sure to grab this once nakita ko sya! whoaH! I will try this soonerrrrr. I have tried also something like a powdered pesto. It's in green packaging. It's good too. I haven't whipped up a pesto pasta dish at home yet, but there's always a first time, right? Thanks for sharing your recipe! i tried making this last christmas but not succeded,i will try again nxt time.. I will try this! One of my all time favorite pasta! and see Clara Ole products is good! I wanna try this one.perfect timing for my husband Bday coming.im sure my chikiting and my mister would really like it. mahilig kasi kami sa pasta. :)Thanks for sharing your recipes.God bless us all! I love Clara Ole! We love their spaghetti sauce, but haven't tried this Pesto sauce...I was reluctant kasi, baka iba lasa...and now no worries! I'll do this recipe.Thanks! look so yummy, thanks for the recipe iw ill probably try this one hooray! I tried it and I must say it really is a Pesto! Hi Vdet! Drain the tuna first. ^_^ Good luck and let me know how you like the tuna pesto pasta!